The Sequester Is Inevitable. Prepare to Suffer. The question is no longer whether the automatic spending cuts of budget "sequestration" will start to take effect on Friday. The question is how long lawmakers are willing to let those cuts stay in place. That, in turn, will depend on how quickly—and how severely—the cuts affect people's lives. President Obama and his allies predict dire consequences, for the economy and for a wide array of government services. On Sunday, they released a report detailing how the cuts would play out in particular states. Kids in Georgia wouldn't get their vaccines, defense contractors in Texas would lose work, teachers in Ohio would end up on furlough—the list goes on. Republicans and their allies have answered by suggesting the administration is exaggerating. "Over the next ten years, the sequester amounts to a $1.16 trillion cut, or roughly 3 cents on every federal dollar," National Review editor Rich Lowry wrote on Friday. "If we can't squeeze a couple of pennies out of every dollar, we might as well begin our great national bankruptcy proceedings right now." The effect on the economy could be equally blunt. The recovery is already pretty weak. Taking money out of it, which is what the sequester cuts would do, would make it weaker. Non-partisan analysts, including those at the Congressional Budget Office and private firms like Macroeconomic Advisers, predict that the sequester cuts would reduce growth by anywhere from a half to a full percentage point in the next year. That would probably reduce the number of jobs in the economy by a few hundred thousand. The unemployment rate, which has been slowly dropping, would probably remain at around 8 percent. By the way, it's entirely possible the economy is already suffering because of the sequester cuts: Many analysts believe that decline in defense spending, in anticipation of the automatic cuts, are the reason the economy unexpectedly (and distressingly) shrunk in the final quarter of 2012. To be fair, even conservatives don't think the sequestration is a smart way to pare the budget. "It's a terrible way to cut spending," Senator Tom Coburn, Republican of Oklahoma, said on Fox News Sunday. But he and his allies obviously think the sequester cuts are preferable to Obama's alternative, which would replace the sequester cuts with a mix of spending cuts (spread more carefully across discretionary spending and entitlements, including health care) and tax increases (via tax reform that closes loopholes benefiting the wealthy). In much the same way, Obama and the Democrats hate the sequester cuts less than they hate the Republican alternative, which would significantly reduce spending on programs for low-income people in order to protect the defense budget. On balance, the public's preferences are probably closer to Obama's.3 That's why Republicans are arguing the sequester cuts won't hurt so much. Of course, within a week or two, political rhetoric may matter a lot less than longer lines at airport security, smaller unemployment checks, and other reminders that less government spending also means fewer government services. Some fine print on my calculations: I'm comparing discretionary spending to gross domestic product. But each one of those terms implies a certain assumption. (1) By focusing on all discretionary spending, I'm including the Pentagon budget. But the trend for non-defense discretionary spending isn't much different. Check out Michael Linden's report on the sequester cuts for the Center for American Progress. As you'll see, the graphs look almost identical. (2) There's a difference between "spending" and "funding." If I focused on the latter, the spike from the Recovery Act would be larger and shorter. For a breakdown of the sequester that looks at funding, see Richard Kogan's summary for the Center on Budget and Policy Priorities. (3) GDP is basically the state of the economy, so a comparison like I've done—expenditures versus the size of GDP—inevitably reflects ups and downs in the business cycle. A more accurate measure would have been "potential GDP." 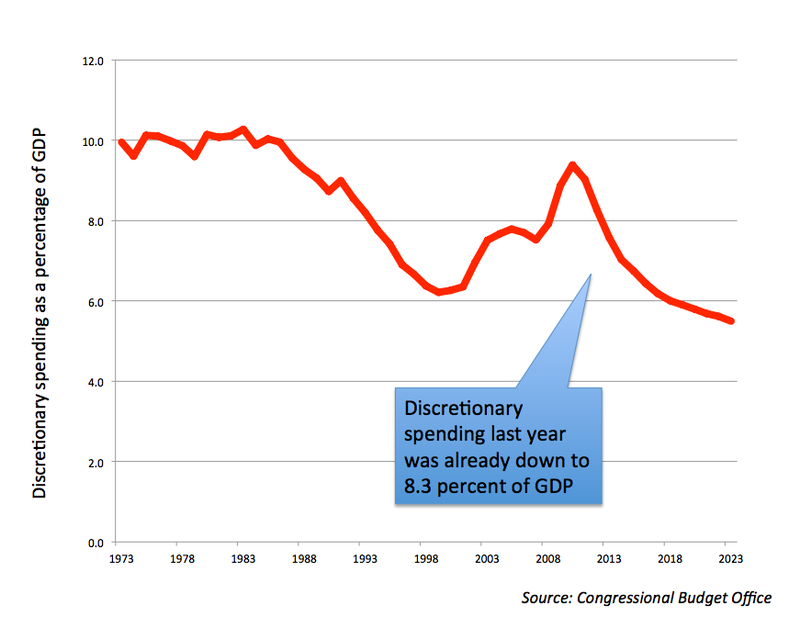 But I didn't have those numbers handy and the overall trend is the same: Discretionary spending is coming way down. Jared Bernstein, a former Obama Administration adviser now with the Center on Budget and Policy Priorities, has a good summary of why the predictions of cuts are probably on target. The polling evidence on this strikes me as more ambiguous than many people assume. Generally speaking, Americans love government programs and hate to pay for them. It's always difficult to predict how they'll react when policy reality forces them to reconcile those views. Still, the public clearly prefers, and trusts, the president more than the Republicans in Congress. And since Obama isn't actually proposing to raise taxes on the middle class—I wish he was!—chances are the voters will side with him if they start to get angry.